Hachimanbara Park (八幡原史跡公園) is the historical site of the 4th battle of Kawanakajima in 1561. The legend said, there was face-to-face combat happened between Takeda Shingen and Uesugi Kenshin at this park. There are many ruins from the 4th battle of Kawanakajima. 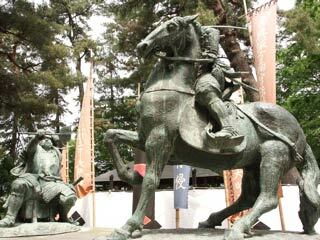 There is the statues of "Ikkiuchi" between Takeda Shingen and Uesugi Kenshin. There is a parking, and restroom. This is the location where Takeda set his headquarters with dirt hills, dry moat and wood barricade. The legend said, there was the face-to-face combat between Shingen and Kenshin here, but the actual battle was happened about 2 km west where Yamamoto Kansuke and Takeda Nobushige, the brother of Shingen, risked their life to protect Shingen. When Kenshin found Shingen and attacked him from horseback, Hara Osumi, who was Shingen's guard, took up Shingen's spear and attacked the mounted Kenshin. His attack missed but caused Kenshin to flee. Osumi, whose mistake allowed the enemy leader to escape, was furious with himself. He drove the spear down upon a nearby rock, which remain at Hachimanbara. When Shingen located his forces in Hachimanbara, he built his headquarters and fortified it with dirt hills, dry moat and wood barricades. He used local enju trees by driving them into the ground with their roots in the air. It is said that some of the trees formed buds, however, and grew for several hundreds years. During the battle, Kenshin found Shingen and attacked him from horseback. Without time to prepare, Shingen could only defend himself with his gunbal, or war fan. Kenshin struck three times, but Shingen managed to deflect each blow with his fan. After the battle, the fan was inspected, and is said to have had seven sword marks in it. Thus this battle memorial is called "Mi-tachi Nana-tachi," or "Three Strikes-Seven Marks." There are Burial Mounds called "Kabanetsuka," which constructed by the owner of Kaizu castle, Kousaka Danjo. After the fourth Battle of Kawanakajima, he gathered the bodies of 6,000 fallen soldiers from both side and had them respectfully interred within the mound. Kenshin was so moved by this gesture that he sent salt to the Takeda Camp, which had been suffering from a shourtage of the item. From this reciprocation of kindness comes the expression, "Send salt to the enemy." About 180m southeast of this site lies another similar burial mound. In the past there were several in this vicinity, but at present only two remain. Today, there is many play ground and it is great spots for family activities. There is Nagano museum, and the statue of Sakuma.